Posted by V the K at 9:01 pm - November 9, 2016. Seems like just a couple of weeks ago, the Democrat Media Complex was wringing its little hands over the thought that Trump supporters might not accept the outcome of the election. Spoiled leftists block freeway in Portland OR. 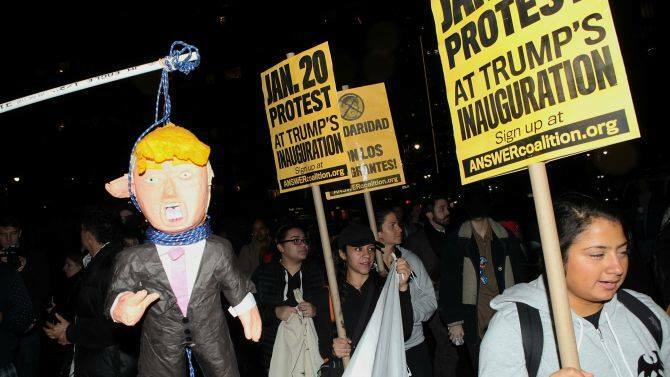 Spoiled leftists in NYC take to the street chanting obscenities in anti-Trump protest. Spoiled college leftists in Washington DC protest Trump by burning the American Flag. Additional #NotMyPresident protest planned for Boston. The Democrat Front Group MoveOn.Org is planning and bankrolling additional protests of the election that didn’t go the way they wanted it to. In California, disappointed leftists are organizing a secession movement. Wonder if these are the same people who threatened military force would be used again to keep the country together if other states wanted to secede from the People’s Republic of Obama. Democrat Media Complex … not especially concerned that Hillary supporters are refusing to accept the election results. Let me ask you, when Mitt Romney lost, did anybody do this? Posted by V the K at 8:05 pm - November 9, 2016. Ace interprets the election in terms of the working class being fed up with being mocked, ridiculed, hated, and condescended to by the elites of both parties. Posted by V the K at 3:18 pm - November 9, 2016. Andrew Sullivan has sadfeels and is raging like Glenn Beck. Umm… yeah, that’s one way to interpret the result of an election where a candidate who held herself above the law and embraced a philosophy of ruling by Executive Order didn’t win. His support is not like that of a democratic leader but of a cult leader fused with the idea of the nation. If he fails, as he will, he will blame others, as he always does. And his cult followers will take their cue from him and no one else. Gee, Annie, sounds a lot like your President Boyfriend and the last eight years. 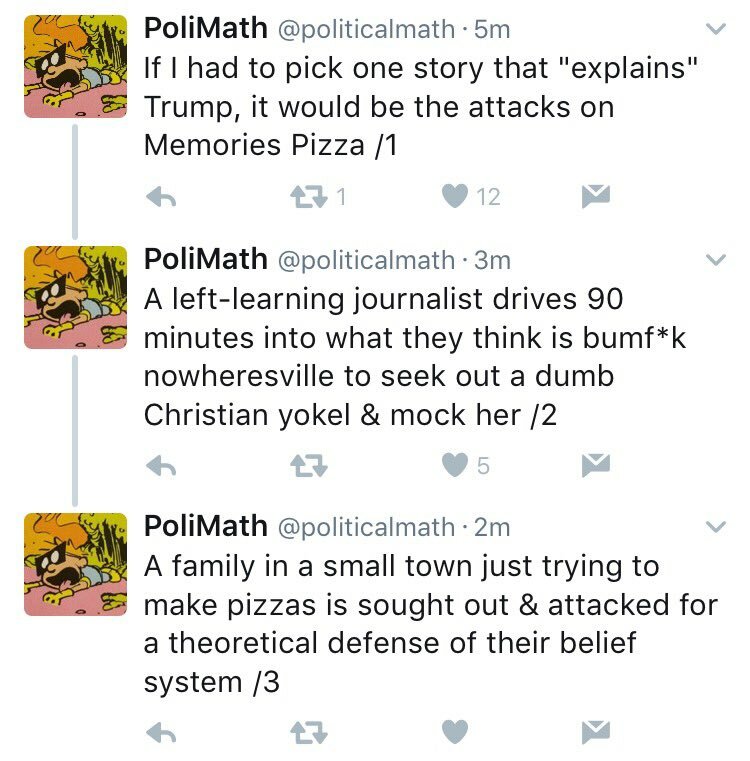 Posted by Jeff (ILoveCapitalism) at 1:38 pm - November 9, 2016. In all their vast coverage of agitated right-wingers, it may have escaped the attention of many in the media that over the past eight years the Democratic Party has moved dramatically to the left on an array of issues. It’s now a party of cultural imperialists and economic technocrats who want to rule through fiat. It is a party more comfortable coercing Americans who see the world differently than in convincing them. It is a movement propelled by a liberal punditry that’s stopped debating and resorted to smearing millions they disagree with. And now, I’ll venture two predictions. 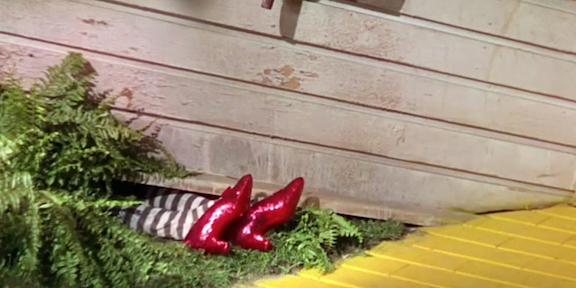 First, Hillary is done. You could say she’s young enough to run again. I say that she’s been hiding serious health issues (perhaps a contributing reason for the 10-hour delay in her concession speech). And under President Trump, she’ll be facing investigation for her long-standing corruption. Her balance of incentives will have shifted: it will be better for her to try to gain public sympathy, by playing the Brave Victim of Harrowing Illness. Which, shock of shocks, might even be somewhat truthful of her. Next, media coverage of the economy will turn very negative. The economy has been quite poor for the last 8 years. The real unemployment rate, for example, is over 11%; not 4.9% as reported officially. The discrepancy arises from the MASSIVE drop in “labor force participation”, under President Obama. During his 8 years, tens of millions of Americans have given up even looking for a job. And once they stop looking, yup, they no longer count as unemployed. That’s a scandal. And the media had zero interest in looking into it, because the answers would have reflected badly on Obama and Hillary. But, because (and only because) Trump will be President, the media will now discover this scandal and change their tune. Mind you, these predictions might not happen tomorrow. Give me, say, up to a year. UPDATE – Made me laugh: John Ziegler of Mediaite thinks the reason Hillary lost is… because the media wasn’t enough on her side as they should have been. Yup. That’s what his stupid non-argument boils down to. Posted by V the K at 11:35 am - November 9, 2016. Posted by V the K at 9:14 am - November 9, 2016. 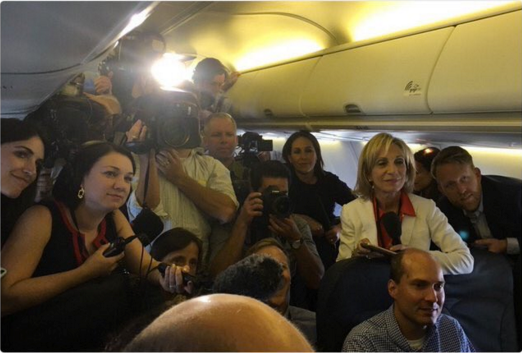 These adoring Democrat Press Operatives in Hillary’s campaign plane (“Broomstick One”) are now the unhappiest people in America. You are free to enjoy your schadenfreude. Twitchy has some pics of miserable Hillary supporters. I mean, you can feel sorry for them, but just remember, they’ve spent the last year calling you “racist, sexist, xenophobic, privileged, know-nothing, Islamophobic, homophobic, uneducated” and every other name in the book. And if she had won, they would be high-fiving each other and reveling in your defeat. Here’s a few more: And Hillary didn’t even have the class to come out and speak to them. Nasty woman, indeed. On that note: Sally Kohn is a miserable woman today. Good. I assume Dan Savage is throwing hissy fits, too, but since I’m blocked from his Twitter feed, I’ll just have to imagine it. My parting thought is to enjoy your schedanefreude from a distance; direct it at the fawning press that was in the tank for Hillary from Day 1 and for her most obnoxious supporters. If you know people who are disappointed today, give them some space for a while. They will need it. Update: John McCain, Lindsey Graham, Chuck Schumer, and Pocahontas Warren all have to address Donald Trump as “Mr. President.” Just try and not be happy about that. Update: The leftist ladies of The View have uber-sadfeels this morning. Update: Last night, as the Blue Wall crumbled, Rachel Maddow looked like she had been pepper-sprayed. Update: America, Wonkette is very, very cross with you. 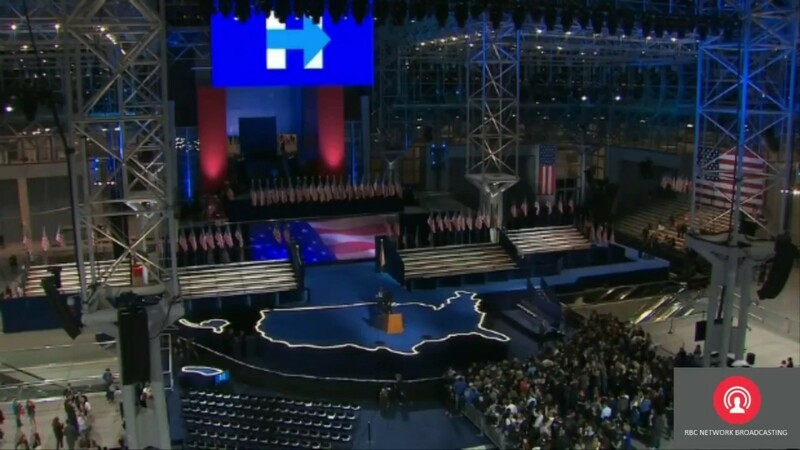 I’m still kind of blown away by the elaborate set-up the Clinton people had for the victory party she didn’t have. How much Wall Street Donor Money do you think went into this thing? Posted by V the K at 8:51 am - November 9, 2016. I did not believe Donald Trump would win. But, granted, a lot of this was a choice to embrace calculated despair. I didn’t dare believe, after the last eight years, that there was any hope left to be had. I didn’t want to be let down again. I willfully dismissed any indication that Trump might pull it off as wishcasting because I simply did not wish to be disappointed. I am pretty stunned that Ron Jonson and Pat Toomey held on in the senate; disappointed about Nevada though. I guess its Californication is complete. On the plus side, my (often wrong) instinct on Trump is that as an old man with a large ego, he is going to be very focused on how history will remember him. I think this will make him focus on getting Big Things right; because he will want to be remembered as a Great President who did Bigly Things. Thus, I’m not concerned at all about what he might do for “LGBTQXYYZ People” because despite its exaggerated importance in the media, gay rights are little things, historically speaking. On the minus side, Donald Trump is a de facto Independent who ran as president under a Republican label. Mike Bloomberg pulled the same stunt in NYC; but NYC seemed to like him OK, even with his loony positions on soft drinks and gun control. He has the opposition not just of Democrats, but also the Republican Establishment, the Mega Banks, and all the Democrat-Media Complex. His task will not be an easy one. Not to mention, the embedded Obamacrat operatives throughout the Federal Bureaucracy who will be working to sabotage him at every turn. BTW: Here’s the list of 23 celebrities and sort-of celebrities who promised to leave the country if Trump won. I will be surprised if even 1 of these overprivileged airheads even follows through. But I hope I am wrong. Posted by Jeff (ILoveCapitalism) at 3:01 am - November 9, 2016. That’s something I never thought I’d type. But as of several minutes ago, the Associated Press just called it for Donald Trump, and NBC claimed that Hillary had conceded privately. I was against Hillary because I knew that, as she is arguably America’s most corrupt politician – the poster-woman for the Big Government – Big Banking complex, and the biggest liar in American politics today – she would make a bad President. But I was never for you, Mr. Trump, because although you seem like a good man in some ways or at least a businessman, you are a recent Democrat and not much of a libertarian. As only one example: you still think, somehow, that big government spending is awesome. With Hillary, I knew that we would be getting a terrible President. With you, Mr. Trump, I think we *might* be getting a terrible President; or we might getting a good President. Because maybe you’ll surprise me and exceed my (not very high) expectations. PLEASE show us over the next four years, in a good way, how much I’ve been wrong about you.